Some of these creatures have had more than a tough start in life. How did it all get so bad? Things may finally be looking up. Now, pups are faced with a brand new adventure as they settle down into life in their new home. 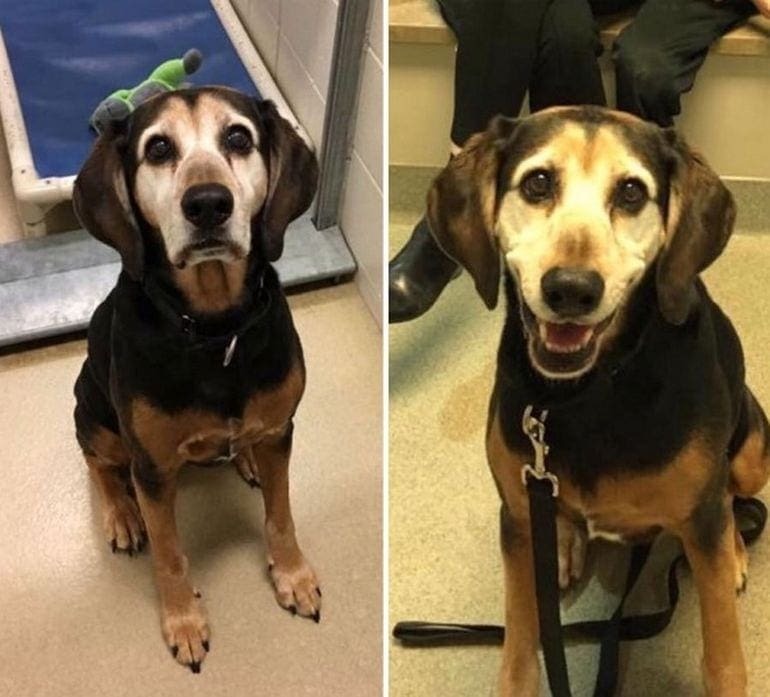 These photos of dogs before and after they got adopted show just how much of a difference you could soon make in a canine’s life. We’re not crying, you are. Back in the shelter, this little one was at their lowest. With no one around to love them, would anyone ever arrive to care for this abandoned pooch? At last, all their prayers had been answered! Instead of sadly hiding away, this four-legged friend now gets to enjoy the outdoors in their brand new bandana. Who knew that dogs could smile? The ears are the first thing to give away this dog’s happiness. 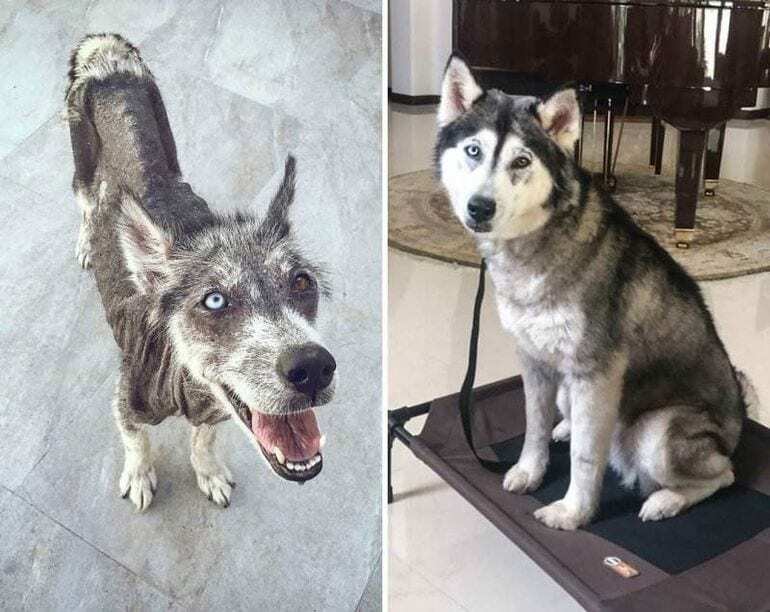 After living out life in the shelter, it looked as though there was no reason to be happy anymore. Now they are surrounded by a loving family; this pooch has all the right reasons to smile. It’s just time to get exploring all that new found freedom! Many dogs enjoy a trip to the park. The open air, the green grass, and all those other dogs to say “Hello” to, could there be a better place to enjoy being a pooch? Unfortunately, this little one never knew it would be her last visit to the park with her initial family. After they arrived, her family abandoned her. Two years and plenty of love later, and she has been transformed back into her old self! Who says that human care and tennis balls can’t make the world a better place? As well as growing all her hair back after the stress caused it to fall out, this girl has also learned to embrace the wonders of the sunshine rather than fear outdoor spaces. Adopting a dog can bring a lifetime of wonderful memories. The first time they are brave enough to go outside alone, that first cuddle on the sofa, or the moment you know you have truly bonded. These are all incredible experiences like no other in the world. 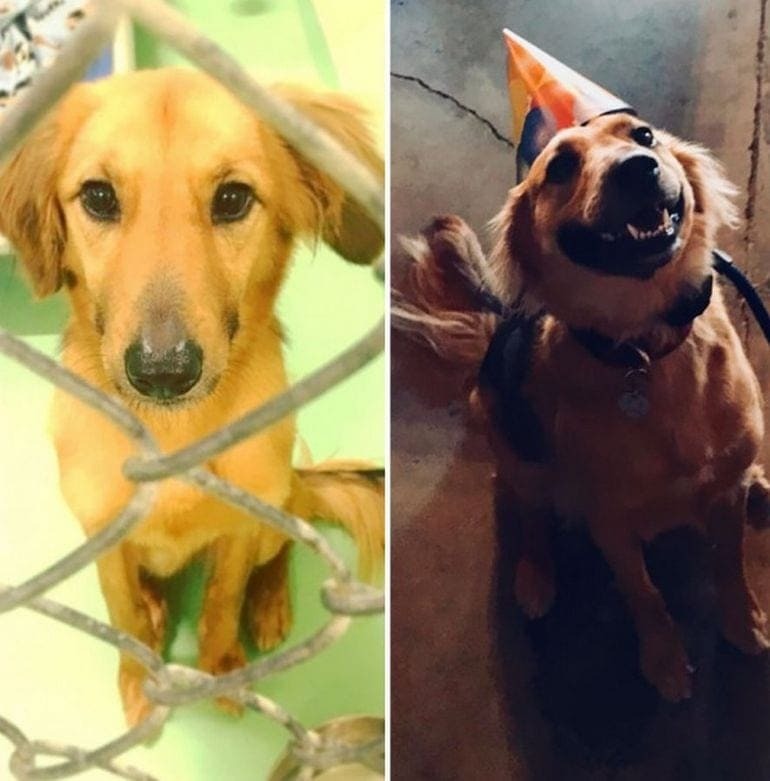 Although this new owner never learned of their new companion’s birthday, they weren’t about to miss the anniversary of their adoption. Even the pooch was excited and got into full swing with their party hat. Have you ever found yourself looking for a sign? 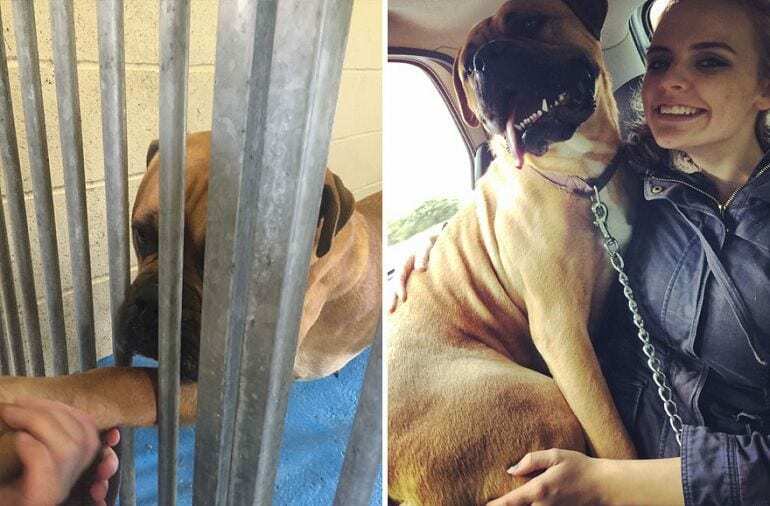 This dog sure wanted to give her new owners a good one that they were making the right choice. All it took was a reach through the bars to let them know that everything was going to be alright. In the shelter, this bullmastiff looked lost and scared. All it took was some human love in the car ride on the way home, and Pickle knew she had made the right decision. Perhaps it’s the dogs that choose us after all? Occasionally there is a dog in the shelter that gets everyone talking. It could be their personality, unusual looks, or difficult upbringing. For this little one, it was their ears and all-white fur that got everyone talking. 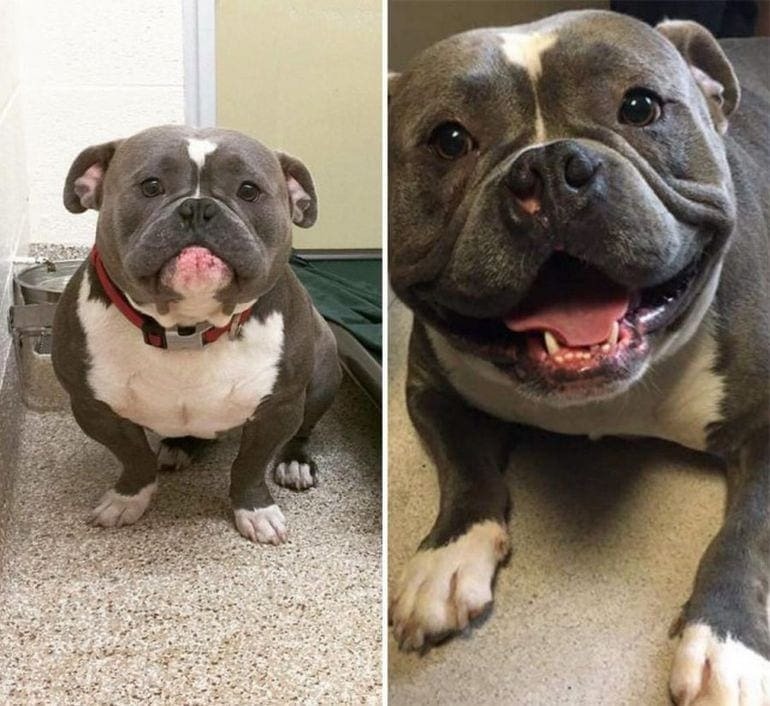 How could such a unique looking pooch end up in a place like this? One year later and it looks as though this owner has adopted a polar bear! This white Alsatian may have grown into their ears, but they are never too big for a cuddle. If ever there was a sad looking dog, we think we have found them. What had happened that could have been so bad? Whatever it was, this little one now found themselves living out their days in a shelter. Who knew how long they could be there? Lucky by name, lucky by nature as it wasn’t long before this pooch was snapped up by a brand new loving family. This dog now has all of us grinning ear to ear. We’re not crying; it’s allergies – promise. When this little one was brought into the shelter, no one knew anything about their breed. All the staff knew was that the puppy had been running around a busy interstate and was in danger of getting hurt by a passing vehicle. They couldn’t leave the pooch to suffer and brought them to the closest home. 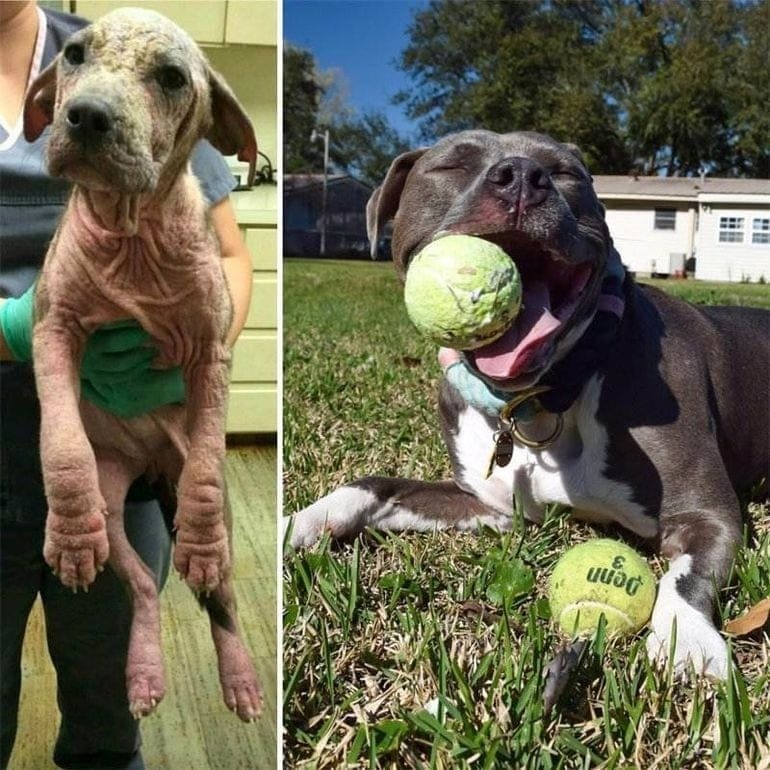 After just 30 days this little dog was unrecognizable. 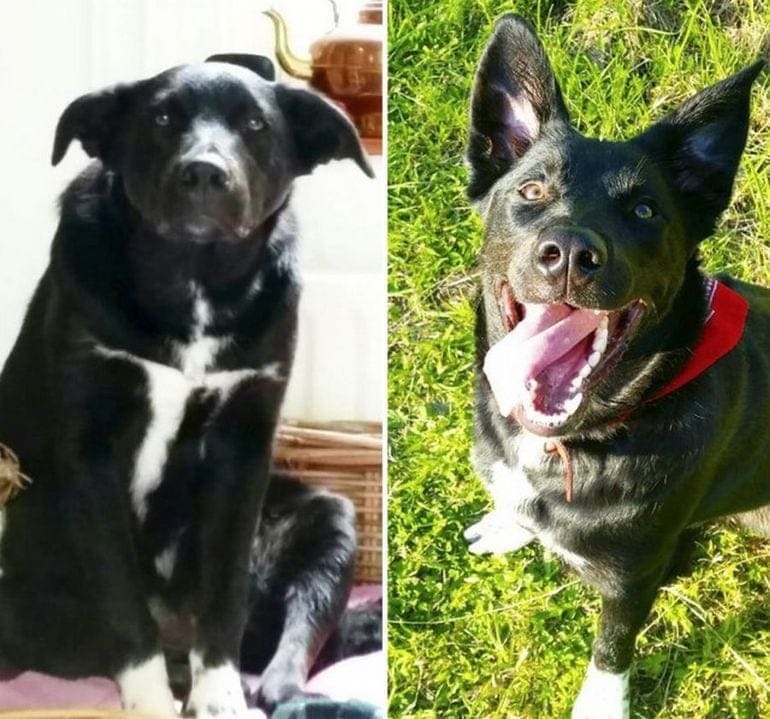 With a full coat of black fur and bright eyes, this dog has finally been given a chance to enjoy life. Heterochromia is a condition where animals are born with two different eye colors. The difference can leave a striking appearance that makes anyone’s peepers pop. 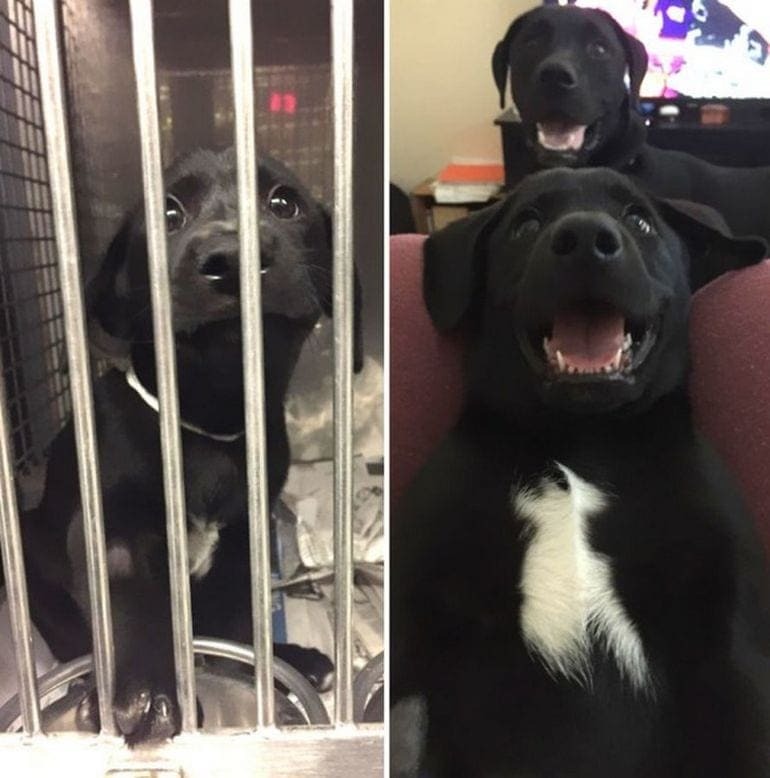 When this pup turned up at the shelter, it was hard to tell what the workers were looking at. In front of them stood a slim dog with mange, but also incredibly striking eyes. Thankfully, just eight months later this little husky has gone on to make a full recovery in their brand new home. Waking down the aisles of the shelter, it can be hard to ignore all the faces looking up for you just waiting to be taken home. After years of struggling, is there any hope that there could be the perfect family waiting out there somewhere? This little guy pulled off the ultimate puppy dog eyes and asked for help by reaching through the bars. Edgar now gets to enjoy his new family life full of happiness. To top it off, Edgar has an adopted companion named Steve, too. Some dog breeds need a lot of grooming to keep their fur in check. Without it, they could end up with a matted coat, mange, or even contract fleas and ticks. All of these are a recipe for various health issues. So when this little one arrived at the shelter, the staff knew they had to take their fur off to find out what lay beneath. Amazingly, there was a completely different pooch hiding underneath the layers of fluff that had overgrown over the years. Now they can start enjoying life and their new haircut. Chihuahuas are dogs that have divided the nation for years. They originated in Mexico and are the smallest dog in the world. Thanks to their tiny size it’s thought they were used as living heaters for anyone suffering from an illness. Sadly, this little one looked as though they had outlived their use as they were next on the list for their final bark. However, one day after their adoption and Cricket was already being spoilt. This owner knew it was time to start giving back to the pooch. Pugs have been a huge craze for many years. Their wrinkled faces teamed with those squished noses make them an instant draw for many people. Sadly, they can also be subject to breathing difficulties as well as problems with their hips. This can often see many of the breed head to the shelter. 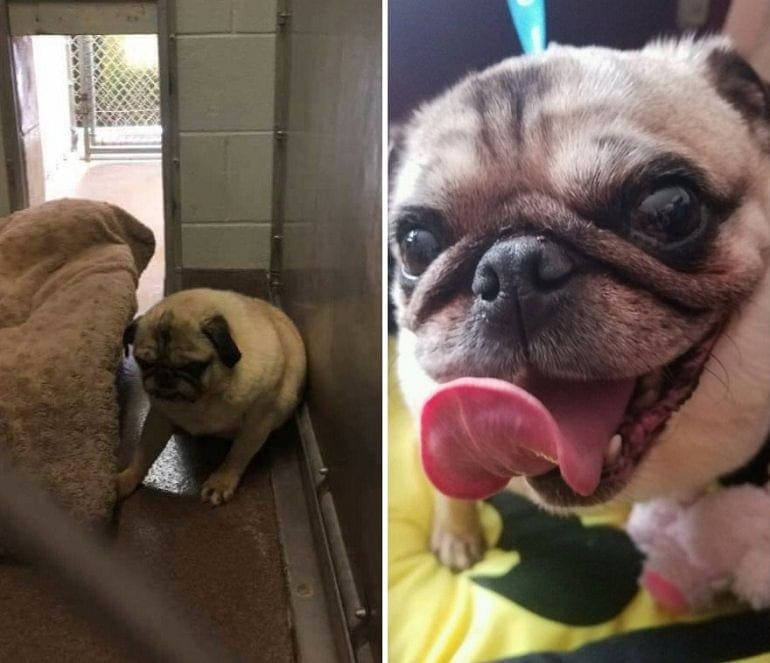 This little pug looked as though he had given up on life before he was adopted. That is until Ziggy Stardust was given a brand new home with a fresh loving family. Would anyone be able to resist the urge of this little pooch with their lightning bolt markings? Especially after the success of the fantasy Harry Potter franchise. Apparently, someone could as this little lady was spotted wandering around outside in the rain. However, her rescuer couldn’t let her go. 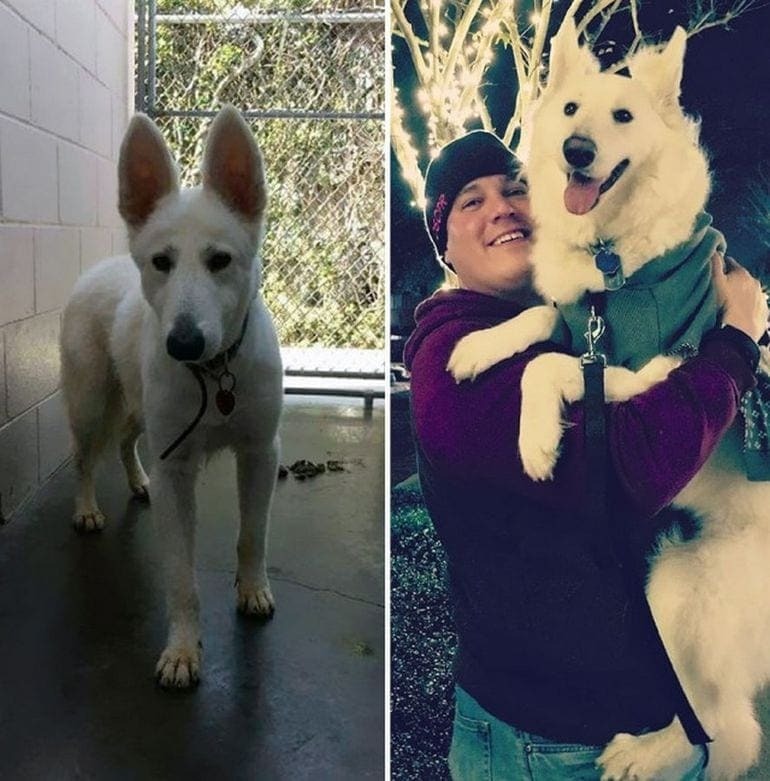 They took her down to the shelter, and a few days later returned with Olive! Sometimes true love finds a way to make anything happen. The best bit? They have been together ever since. 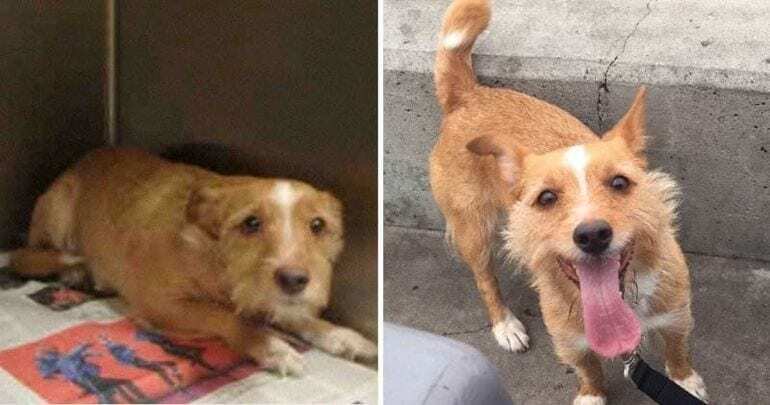 This young pooch was living on the streets before they were rescued. The harsh weather teamed with the dangers of being outside had both taken their toll on the canine. Although the grew up outdoors, Wynter has a brand new name as well as learning to love nature again. No longer do they have to worry about the hard, cold concrete underneath them. Now, Wynter gets to enjoy the plush grass in their new owner’s backyard. Sadly, not all the dogs that enter these shelters will make it out the other side. Although they are there to meet a new family, sometimes no one comes along, and the shelter needs to make room for new arrivals. That’s where one person stepped in to save little Rey. Before, she was just one day away from her final meal. Only 24 hours later and this little one has already transformed into an entirely new dog! They say dogs pick up on emotions so her new family must be overjoyed with their companion. Sometimes things happen that seem to be down to fate. Perhaps it is a chance meeting or being in the right place at the right time? Whatever it is, it can be impossible to find a reason for some of these events other than it was meant to be. Amazingly, this is what happened to this girl. Oakley’s new owner never believed they would be walking home with a new pooch. 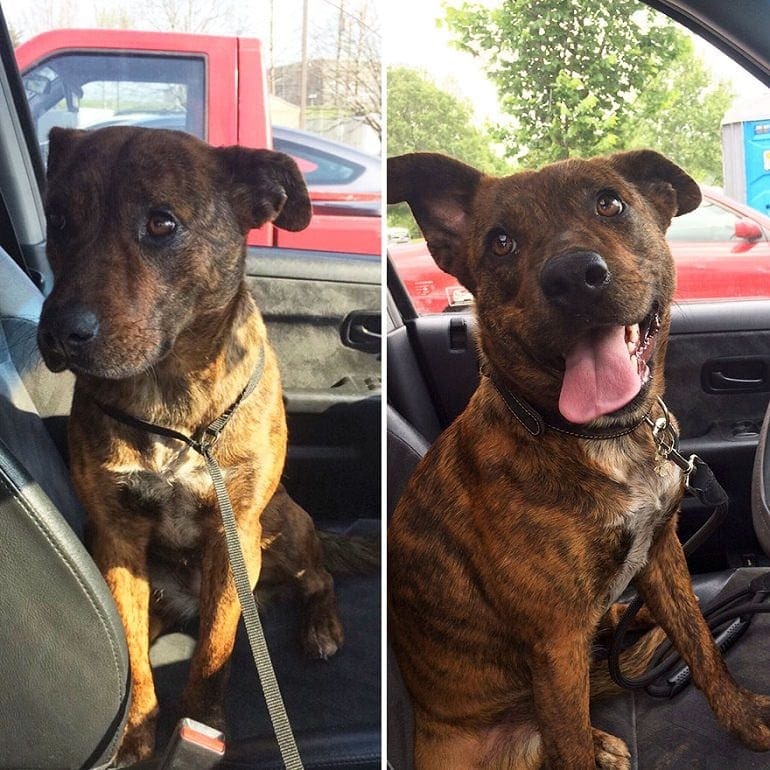 The same car, same dog, just one month apart. 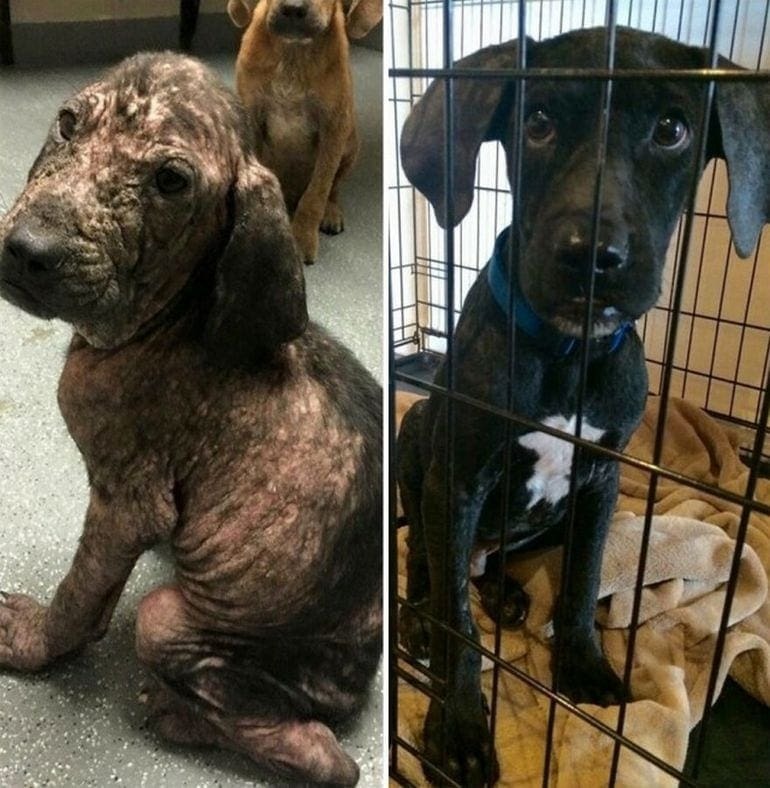 What a difference 30 days of love can make. Back in his days at the shelter, this dog was forced to sleep on a cold floor with only a plastic tray as a pillow. 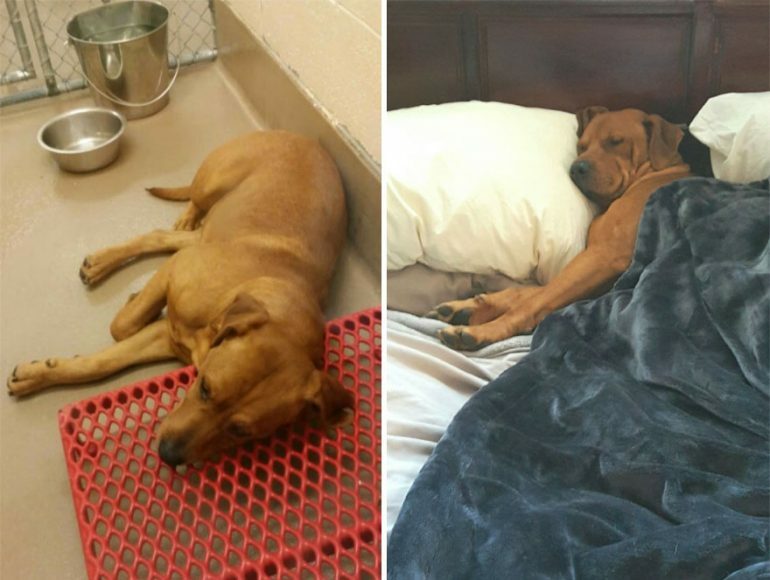 He might have been under a safe roof, but the shelters can’t afford to buy all the dogs brand new beds. What a difference two years makes. No longer does Toby have to sleep on the floor. Now, he can take his rightful space in the middle of the bed with a loving owner on each side. We’re sure Toby is making the most of his new sleeping arrangements. 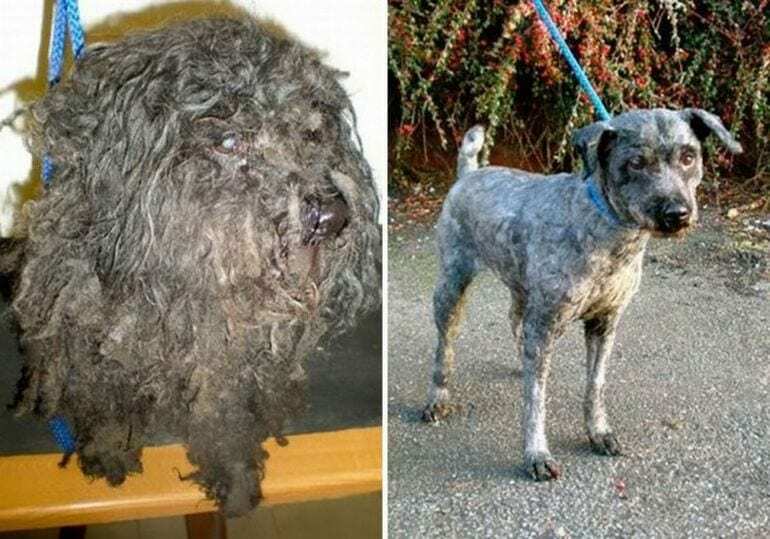 For many years, this little pooch had been subject to unbelievable living conditions. The harshness of his surroundings, teamed with the mistreatment he faced, left this dog feeling timid and cut off from the world. Even after all those years of struggle, Hank’s new companion has been able to bring the pooch out of his shell. 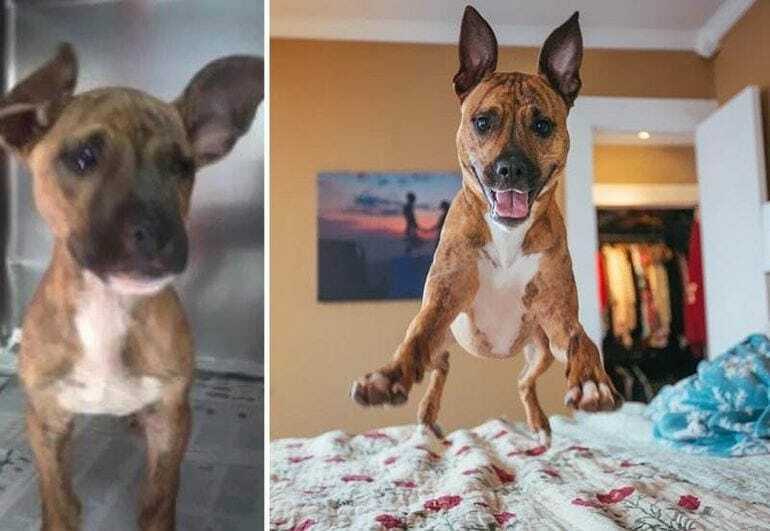 Now, this dog can’t stop jumping for joy! Who knew a dog could look so happy? You go Hank – don’t ever let anyone bring you down again. Many times, people breed dogs without thinking of the repercussions. The cost that goes into raising the puppies teamed with the task of finding them all homes can be a tough job to handle. Unfortunately, this means a lot of youngsters end up in shelters. 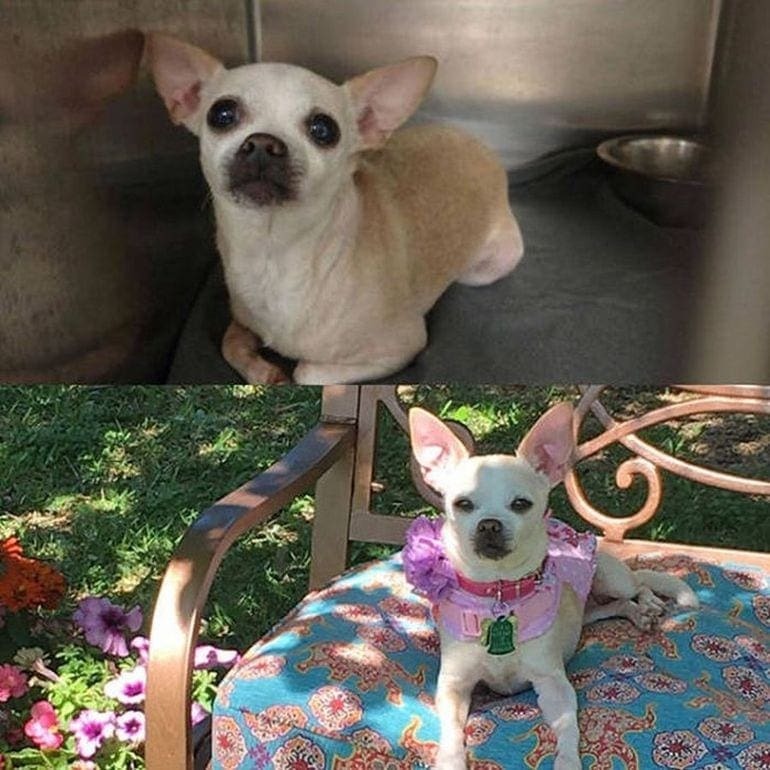 This little girl was just 7 pounds when she turned up for adoption. Even though it has only been one month, Penny is now full of joy as she learns what it’s like to enjoy being a puppy. 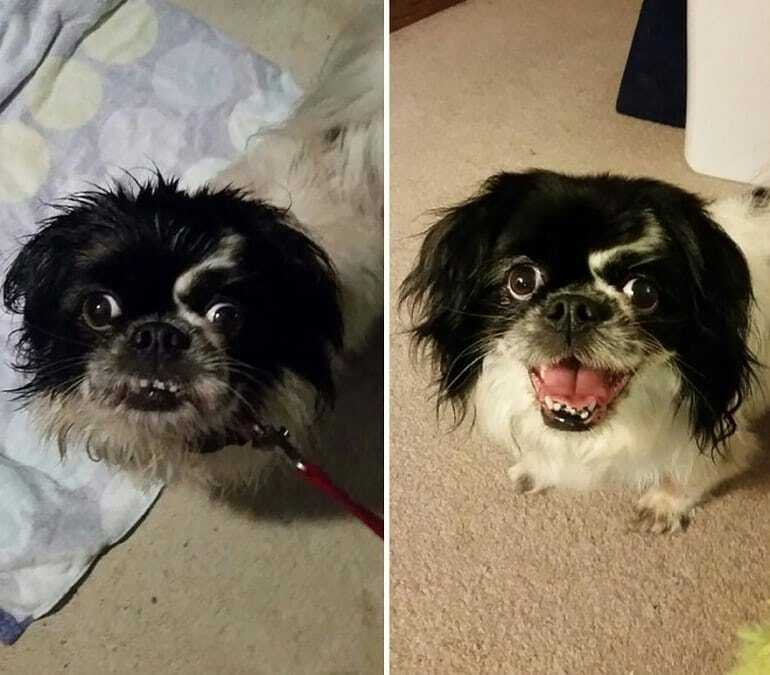 This little dog was known as Mack when a Reddit user shared his photo to the internet. Would anyone be able to resist those puppy dog eyes? Amazingly, thousands of people all came together to find this pooch a home, and now he is known as Frank the Tank in his brand new home. 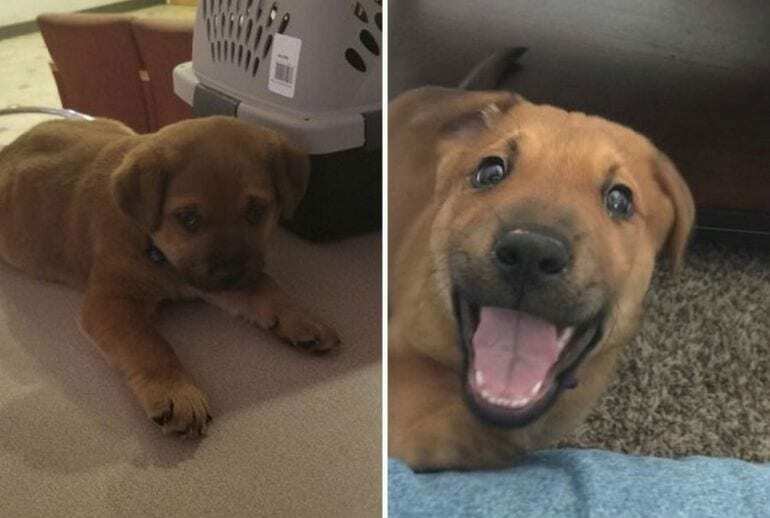 It’s easy to see the difference in his smile after finding his forever home. Plus, after his internet fame, Frank now has his successful Instagram page with nearly 17,000 followers!